Last weekend, my husband and I took a jaunt south to Kennett Square to do some antique shopping (read: add to my vintage camera collection!). We've visited before and stayed again at Kennett House Bed and Breakfast. I definitely recommend them, if you ever visit. Kennett Square touts itself as the mushroom capital of the world. So needless to say, every restaurant we visited had a variety of mushroom options on the menu. It inspired me to come home and create my own! We are already HUGE mushroom fans. I love that the local grocery store routinely carries a variety of mushrooms. In season, I can find even more at my local farmer's market. For this recipe, I used white mushrooms with oyster and portobello varieties. 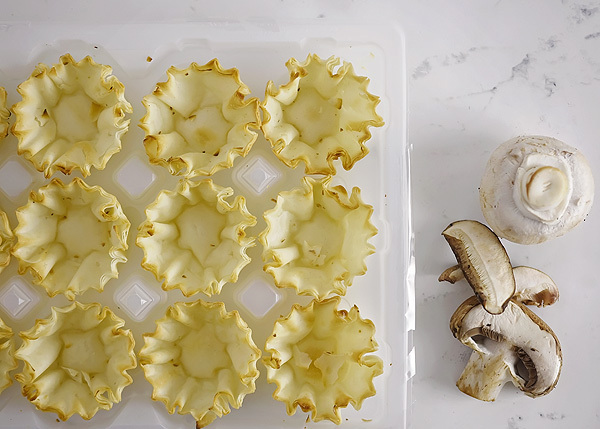 I used pre-made, mini puff pastry shells and simply layered goat cheese and mushrooms. This is such a quick and easy recipe . . . perfect for appetizers or you could make a larger tart, sliced. First dice the mushrooms into very small pieces, discarding any woody stems. Then saute in a blend of butter and olive oil, seasoning with salt and pepper. As they cook, the mushrooms release moisture. You want to drain this off. Add a dollop of softened goat cheese to the bottom of the pastry shell. Now fill the shell to the very top with the cooked, diced mushrooms. Bake them in the oven for 10 minutes, just to allow the cheese to melt. And then drizzle honey over the top of them (not shown here). The sweet, salty, savory bites are amazing! Sure to convert anyone who thinks they don't like fungi. I added a small leaf of parsley to garnish. Enjoy!